Welcome to our blog countdown to the announcement of our 2015 ONE Africa Award Winner! Our second finalist is Global Shea Alliance (GSA), a 350 strong membership group spanning 25 countries with its headquarters in Ghana. It engages all parts of the shea value chain – from the exclusively female collectors to suppliers, international food and cosmetic brands, retailers, governments and consumers. 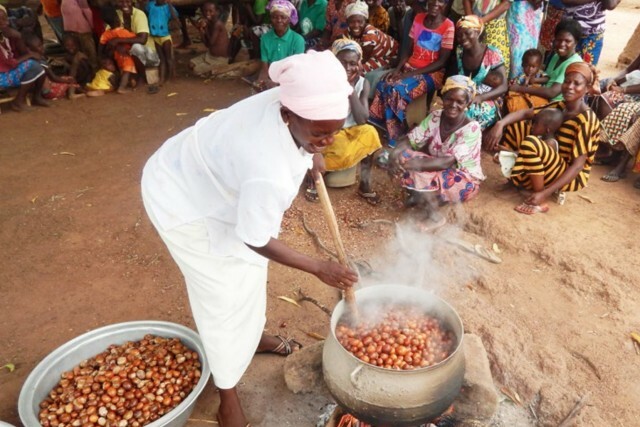 Because women exclusively collect shea, it has been known for decades as “women’s gold.” In Ghana, for example, shea provides more than half of the annual income of rural women. GSA educates women’s groups about their rights and strategies to improve their income and encourages suppliers, brands and retailers to commit to fair business practices as members and sustainability partners. It also works with non-profits and governments to champion laws and policies that empower the base of the value chain while striving to increase shea exports. Women collectors play a vital role in the shea industry, as they stand at the foundation of the value chain. They have previously lacked bargaining power and recognition within the industry. Without collective bargaining rights or quality training, women have in the past had little leverage in obtaining a fair price for their goods. The GSA is committed to formalising the shea gatherers into collectives, as well as educating them in the workings of the market. Most GSA activities directly benefit women’s groups. These activities include business development training and health and safety initiatives. In the past year, the GSA sustainability programme has registered over 52 partners including leading international companies such as The Body Shop, Sundial Brands, and The Hershey Company, as well as small regional brands and women’s groups. In the past year, under grants from USAID and ICCO, the GSA has trained over 20,000 women in Benin, Burkina Faso, Cote d’Ivoire, Ghana, Mali and Nigeria in better quality control and aggregation techniques. This will greatly improve women’s income across the region. Presently, all major companies exporting shea are Global Shea Alliance members. This year, the GSA is supporting 20 warehouses in 6 countries aiming to increase the income of over 5000 individual women collectors in six West African countries by at least 50%. The GSA has also conducted market linkages for over 50 small businesses owned by women in West Africa to sell shea butter to international cosmetic companies. Find out more about Global Shea Alliance on their website and look out for our next Africa Award finalist tomorrow!